With its highly capable 3.3-liter twin-turbocharged V6 engine and smooth yet responsive 8-speed automatic transmission, the rear-wheel-drive 2018 Genesis G80 Sport (all-wheel-drive also available) redefines the term "luxury sports sedan". Combined with a richly appointed sport-inspired cabin, innovative and user-friendly features/technologies and class-leading standardized suite of safety technologies, the G80 Sport is an unrivaled among other mid-luxury vehicles. The 2018 G80 Sport's bold exterior features a sleek profile and well-proportioned shape, strong front face, taut character lines, and a dynamic and sophisticated character. Like the exterior, the interior features a first-class premium cabin design consisting of high-quality materials and the most spacious cabin in its class. The 2018 Genesis G80 Sport will be available in six captivating paint colors chosen to emphasize this model's aggressive character lines and exterior trim highlights: Casablanca White, Caspian Black, Himalayan Gray, Polar Ice, Sevilla Red and Siberian Ice (late availability). An extravagant interior, sport-inspired design aesthetic, intuitive operation of all controls, outstanding ergonomics and spacious cabin accommodations have been signature characteristics of the Genesis G80 model since its inception. The 2018 G80 Sport builds upon this exemplary interior design with the addition of driving enthusiast-centric features and trim. Heated and ventilated driver and front passenger sport seats are complemented with additional torso and thigh bolstering. This makes them as supportive when navigating a sweeping turn at speed as they are comfortable for everyday driving and long commutes. Specifically chosen to be a stylish fit with the available exterior paint hues, interior color choices include black or gray leather (the latter color available exclusively with the Casablanca White, Caspian Black, or Sevilla Red). 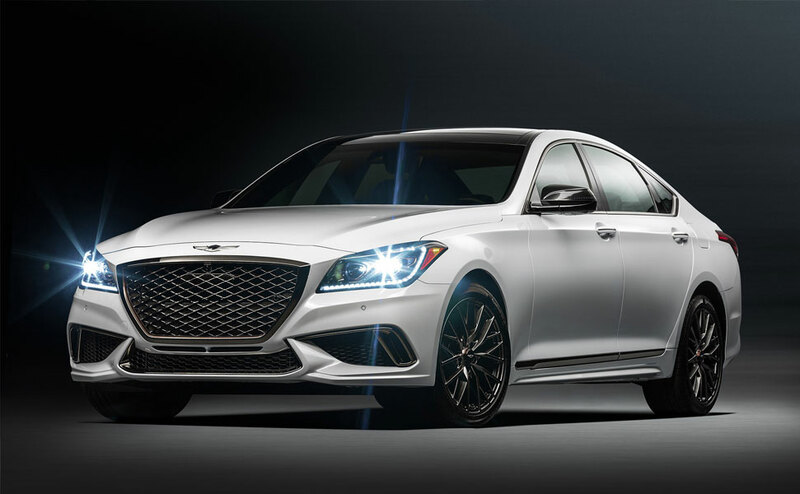 Engineered to offer the ideal combination of maximum performance and comfort, the 2018 Genesis G80 Sport will not only impress drivers with its responsive power production, but also with its luxury-class refinement and composed operation. 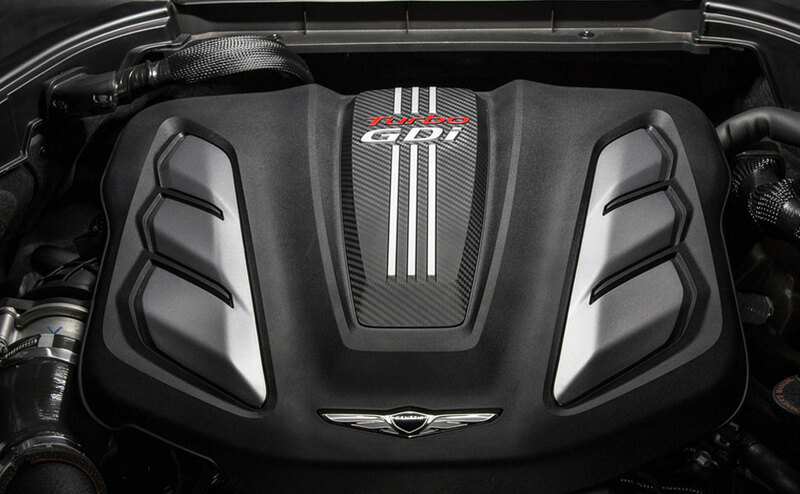 The 2018 G80 Sport is powered by a vigorous New Lambda II 3.3-liter twin-turbo v6 engine, a direct-injected engine with 365 horsepower and 376 lb.-ft. of torque. Sodium-filled exhaust valves boost performance and efficiency while offering structural reinforcement for improved durability. This results in a cleaner and more efficient burning of the fuel within the cylinder, improving power production while also reducing exhaust emissions. 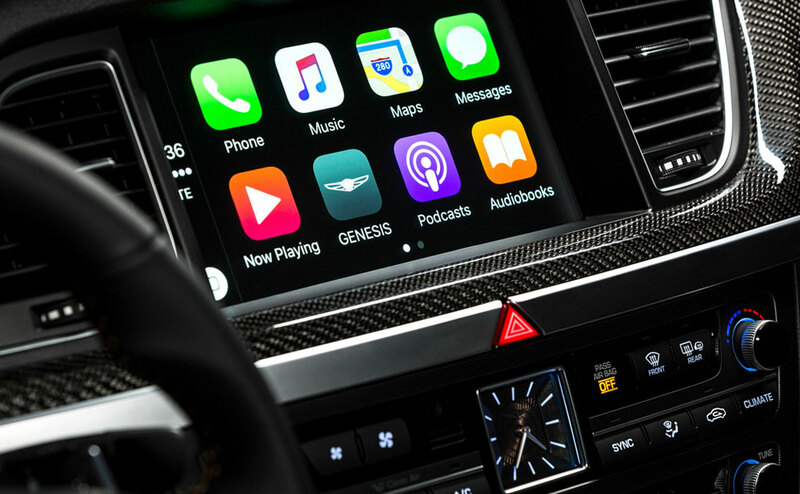 The Genesis G80 Sport benefits from an advanced 2nd-generation 8-speed automatic transmission with driver-invoked SHIFTRONIC® manual gear selection via paddle shifters delivering world-class performance with a smooth rev-matching feature for sublime operation. This next-generation automatic transmission is specially tailored to maximize performance and improve fuel economy. One look at the Genesis G80 Sport's proportions-a long wheelbase in relation to its compact front and rear overhangs-foretells of the car's handling proficiency. And the G80 Sport doesn't disappoint, thanks to well-engineered suspension and steering systems, accompanied by a refined and highly capable platform fortified with exemplary structural rigidity. The G80 Sport's rigid structure is composed of nearly 52 percent of Advanced High-Strength Steel (AHSS) offering superior dynamic handling performance, world-class NVH levels and exceptional collision performance. In addition, to reduce unwanted NVH from penetrating into the cabin, a double-block engine partition structure with a specially-designed insulator has been added to the firewall/engine compartment, along with a diamond-shaped strut brace system and aluminum shock absorber housings to help increase the platform's structural rigidity and enhance dynamic handling performance. Along with the improved rigidity, noise reduction and crash protection benefits, the use of aluminum in the shock absorber housings has reduced the weight of these components. The G80 Sport also employs an impressive braking system to provide the driver with greater confidence in the vehicle's stopping power as well as more communicative brake feel. The G80 Sport includes a driver-selectable Intelligent Drive Mode which allows the driver to select between four distinct modes-Eco, Normal, Sport and Snow-depending on driver preferences and/or driving conditions. Each drive mode reconfigures throttle responsiveness, transmission mapping, stability control, suspension and steering for each setting: Eco (maximizes fuel efficiency), Normal (adjusts parameters to optimize comfort), Sport (alters transmission, throttle, steering and i-Driving Mode Integrated Control and the Traction Control System (TCS) while stiffening suspension for maximum all-out performance) and Snow (optimizes tractability in low-traction conditions such as ice or snow). Additionally, the Sport mode is enhanced with improved kick down responsiveness and quicker manual shift gear times for maximum performance and efficiency. Of note, the Intelligent Drive Mode functions seamlessly with the available H-TRAC All-Wheel Drive in G80 Sport vehicles so equipped. 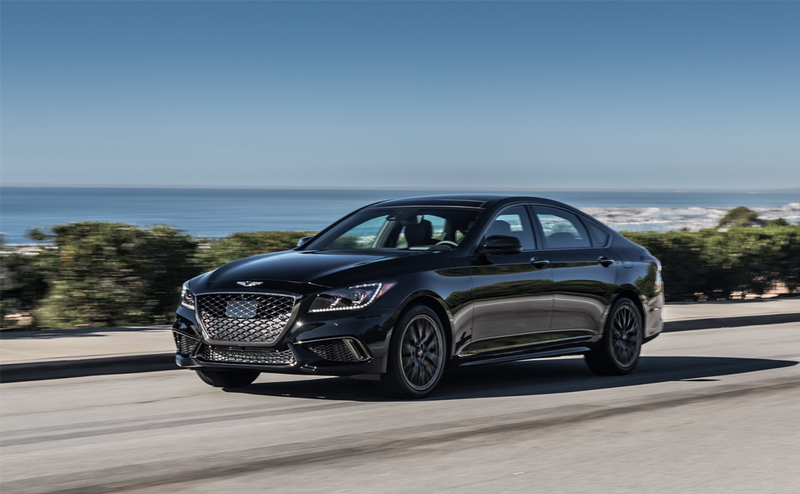 Developed in collaboration with Magna Powertrain, the Genesis G80 Sport's available H-TRAC All-Wheel Drive is a lightweight system that features an electronic transfer case with active torque control. What's more, thanks to an electronically-controlled multi-plate clutch in the transfer case, torque can be seamlessly and quickly routed to the front wheels for improved vehicle stability in slippery road conditions. Best of all, the H-TRAC AWD system allows for a higher torque distribution range by offering a dual-sport mode that is linked to the Intelligent Drive Mode than competing vehicles within its class that offer an AWD option. Beyond the performance exterior and sport styling, the G80 Sport comes well equipped with luxury convenience features, advanced technology and first-class amenities not only for the driver, but also the comfort of all passengers. Illuminated door sill plates greet all passengers as they enter the G80's illustrious cabin. The driver is lavished with premium convenience features such as a 16-way power driver seat with an integrated memory system, Qi wireless device charging and a power hands-free smart trunk with auto open. All passengers can enjoy the fresh air from a power tilt-and-slide panoramic sunroof, and if rear seat passengers require protection from the sun, thoughtful manual rear side window shades plus a power rear sunshade are accessible. 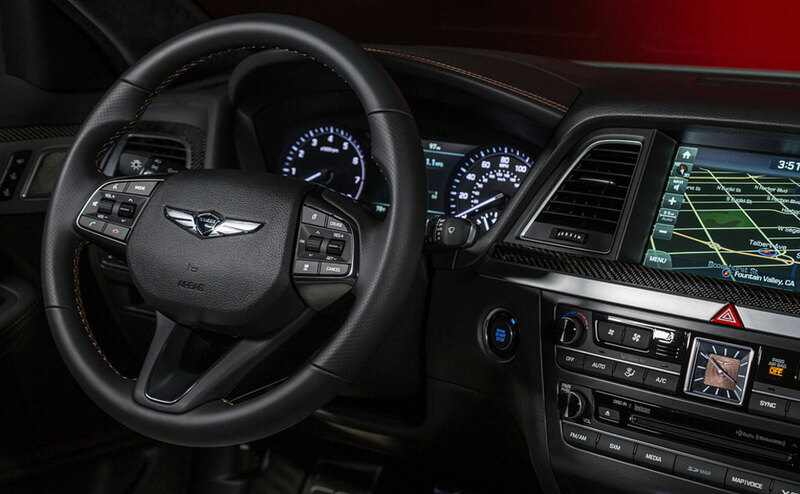 Every G80 Sport includes the 17-speaker (including 10-inch subwoofer) Lexicon premium surround sound system with QuantumLogic® Surround processing technology that transforms any stereo or multi-channel audio source into a rich and immersive sound experience. Residing atop the center stack is a premium AVN 2.0 navigation system with 9.2-inch touchscreen/720P high-definition touchscreen display-the first of its kind within its class.